Now you don't have to decide whether you like a black or white XBOX controller, because XCM has mutated them into one and added LEDs to boot! Redesigned and optimized to deliver outstanding playability, the XCM Xbox 360 Wireless Control Pad Shell comes equipped with an ultra-large D-Pad that allows your thumb more room to move while in use. This incredible new feature will prevent players from accidentally hit their controls in the wrong D-Pad direction while trying to access something else (something many of us have suffered with for a long time). This feature is incredibly useful when switching weapons on shooters like Gears of War and Call of Duty. 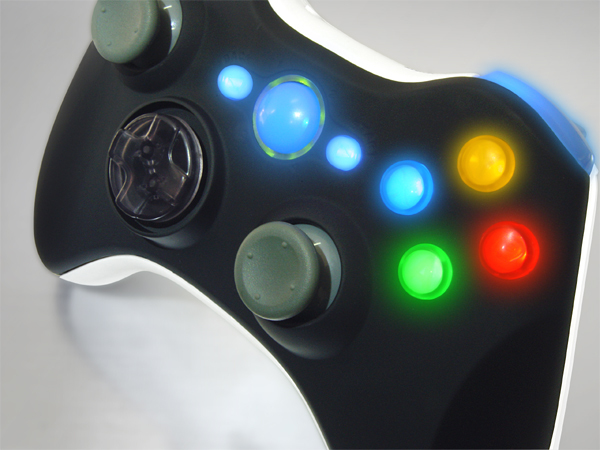 In addition to it's innovative functionality and control, the XCM Xbox 360 Wireless Control Pad Shell is easy to install, and features a stylish look with vivid LEDs. Note - This is not a full controller. This is a mod for your existing controller.